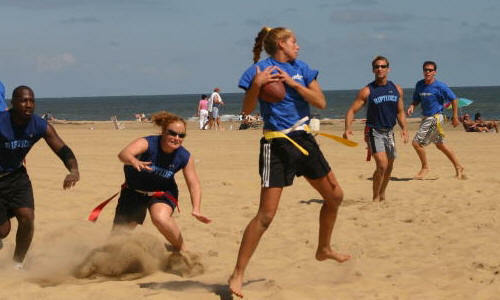 Flag football is a game which offers a wide array of positions for players to enjoy. If you have a strong arm, you might wish to give the quarterback position a try. If you�re skilled at running around people and have quick reflexes, then running back might be the spot for you. Whatever your skill, there�s a little something for everyone on the flag football field. In this article, we�ll be taking a closer look at all of the possible flag football positions. We�ll examine their responsibilities, advantages, disadvantages and whether or not any special rules apply. By the time you�re done reading this, you�ll hopefully have a good idea of which fantasy football position is best suited for you. Quarterback – Regardless of the size of the flag football team, there will always be a quarterback present. They either receive the ball by having it snapped to them by the center, or they simply have the ball in their hands to begin the play (especially with smaller teams). The quarterback will often start the play by yelling �Hike.� When they receive the ball, they may drop back several steps and begin to scan the field for open receivers. They might also elect to hand or pitch the ball to the halfback or even run with it themselves. The quarterback must think fast, as the opposing team may send pass rushers to try and �sack� the quarterback by pulling his or her flag. They must also be accurate, as wild passes can result in costly interceptions for the offense. Quarterback is certainly the most challenging flag football position, as it requires quick thinking, accuracy and a strong arm. In many cases, the quarterback will also call the plays for the offense. Halfback (or Running Back) – The halfback normally begins the play lined up behind the quarterback. When the ball is hiked, the halfback may receive a hand-off or pitch and try to advance the ball down the field. They might also be called upon to stay back and protect the quarterback by blocking, or they might be sent out to act as a receiver. The halfback position requires a multi-dimensional player who can do many things on the football field. Wide Receiver (or Wideout) – Wide receivers line up on the line of scrimmage to begin the play. When the ball is hiked, they will run down the field in a predetermined passing route. Receivers and quarterbacks who have worked together will develop a sense of timing, allowing the quarterback to know where the receiver will be on the field at any given time. If another receiver catches the ball, or if the play goes to the halfback, the receiver will be called upon to block opposing players. Depending on the rules, this may either involve direct contact (usually limited to the chest) or simply getting in their way and impeding their progress towards the ball carrier. Offensive Lineman – The duty of the offensive linemen is to protect the quarterback and buy him or her time to find an open receiver. They will also try to create holes for the halfback to run through. In some flag football leagues, offensive linemen may block with their hands, while other leagues do not allow contact. On smaller flag football teams, the offensive lineman position does not usually exist. Center – A special offensive lineman, the center is responsible for snapping the ball to the quarterback in larger flag football leagues. The center must have quick reflexes, for as soon as they snap the ball, they must raise up and take on a charging pass rusher to protect the quarterback. Pass Rushers – The pass rushers are defensive players who line up across from the quarterback or the offensive line. When the ball is snapped, they rush forward and attempt to grab the flag of the quarterback in the offensive backfield. Even if they are unsuccessful, they provide a valuable service to the defense by hurrying the quarterback and keeping him or her from having to much time to find a target. If the ball is being run by a halfback, the pass rushers will also try to reach the ball-carrier as soon as possible and pull their flag. While some teams designate leftover players as their pass rushers, the smart flag football strategy is to place some of your more athletic players on the line to create a smothering pass rush. Defensive Backs – While the pass rushers line up near the line of scrimmage, the defensive backs are positioned to cover the rest of the field. They will either play man-to-man or zone coverage. In man-to-man coverage, each defensive back is assigned an offensive player to cover. Regardless of where that player goes, the defensive back will follow. In a zone defense, the player covers a certain area of the field, shadowing any offensive player who enters his area of responsibility. If it�s a running play, the defensive backs will swarm towards the ball-carrier and attempt to pull their flag. If it�s a pass, they will attempt to either bat the ball away or interject themselves and go for an interception.